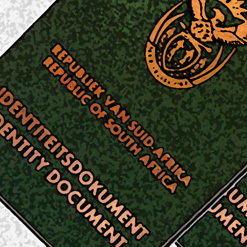 South Africa’s Department of Home Affairs has introduced an innovative new system that will help speed up the processing of identity documents (IDs). According to the Identification Act of 1997 all South African citizens aged 16 years and older are required to carry an ID book as a positive form of identification. A citizen cannot vote or do certain banking transactions without a valid ID. The department’s new system enables officials to scan photos of ID applicants on to a computerised system, which then prints the image directly on the document. This will save officials time, as they no longer have to manually stick an applicant’s photo on his or her new ID. Until now home affairs has only used the digital system to process new South African passports, as a means of meeting international standards. The system, known as live capture, is part of the department’s turnaround strategy, which involves a complete overhaul of document-processing methods. Some 20 home affairs offices in the country have now been fitted with live capture workstations. Each unit is valued at about R250 000 (US$31 000). The government plans to equip every home affairs office with such a workstation by the end of its turnaround drive in March 2011. The drive kicked off in April 2008. The live capture system is also able to digitally capture applicants’ signatures and fingerprints. This will dramatically reduce the department’s admin duties and mass of paperwork, as until now copies of all citizens’ fingerprints and ID photos have had to be manually collected and filed. The system is linked to the department’s headquarters in Pretoria, which means that once an ID applicant’s details have been logged at a regional home affairs’ office, it can instantly determine whether the applicant is on the South African Population Register. This will enable IDs to be processed at the home affairs office where the application is made, as opposed to forms being transported and processed in Pretoria and then returned to the regional office. Such a method will reduce the waiting time for a new ID. Problems with inaccuracy in the past have strengthened the department’s need to capture details electronically. For example there have been gender glitches where a male is erroneously registered as a female, or vice versa, and in some cases home affairs has declared a person dead when he or she is still very much alive. The new Minister of Home Affairs Dr Nkosazana Dlamini-Zuma is adamant that the department needs to move in line with global standards. In many overseas countries citizens are able to apply for documents online. “It is very clear that home affairs does need to ensure we can capture data electronically,” she said, quoted in government’s online news publication Bua News. “Of course with the global economic situation we may not be able to move as fast as we would like, but we will be moving to greater online services,” she added. The minister said the goal is to digitise most of the work that’s currently done manually. “We would eventually want to move towards becoming a paperless department. This is our ultimate objective,” she said. But changing from the old to the new system has not been without glitches. In May 2009 home affairs offices in the process of changing over were beset by IT problems. At the time Home Affairs Director-General Mavuso-Msimang acknowledged that the temporary setback was an inconvenience to the public, but said the changeover was necessary. “Home affairs is moving from some very old technology to new, improved systems. It is the interfacing of these systems that has created some delays in the production of passports,” he said. “The technology upgrades are imperative to the department’s programme to improve service delivery and the security of the passport,” he added. The department is confident that it will be able to achieve a number of its goals by 2011. One of these is to reduce the time taken to issue valid documents such as birth, marriage and death certificates. In 2007 the process took between six and eight weeks. By 2011 the department hopes to issue the documents on the same day people apply for them. The time taken to grant temporary passports and other emergency travel documents such as diplomatic passports and crew member certificates – issued to airline pilots and cabin crew staff to facilitate travel –will also be reduced to one day by the end of 2009. Permanent and temporary citizenship certificates will take one month to issue by 2011, as opposed to the current six-month waiting period due to sluggish document processing. Part of the department’s strategy includes the 2009 launch of a campaign that will run for the next two years. Under this campaign the department will ensure that every child in South Africa up to the age of 14 has a birth certificate. Thousands of children born in deep rural areas in South Africa go without birth certificates because their parents are too far away from a home affairs office. The department’s turnaround strategy will also have a strong human resources component, as its ultimate success is dependent on well-trained, disciplined and competent staff. In the past this has not been the case. According to a strategy document issued by the department, “the current employees’ capacity in terms of numbers, competencies and utilisation are not at the levels required to meet service delivery demands”. As a means of addressing these problems, the department’s human resources division is embracing a new leadership model. This entails an increased delegation of authority to line mangers, who will work directly with staff in processing documents and liaising with the public. The new model will go a long way in reducing tedious bureaucratic processes, as immediate managers will have the power to take decisions and resolve issues without having to consult a long line of senior staff.